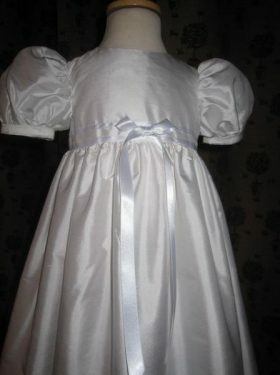 A Girl's Designer Christening Gown, hand crafted by Little Doves. 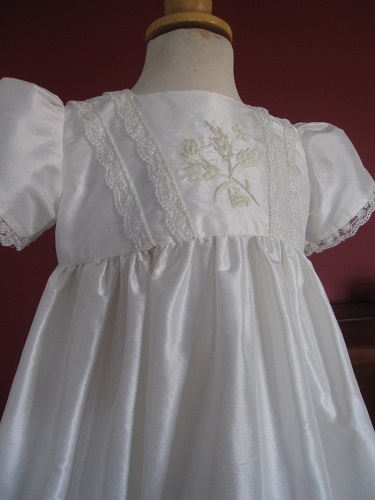 This beautiful hand embroidered Gown is sure to become a family heirloom to treasure. 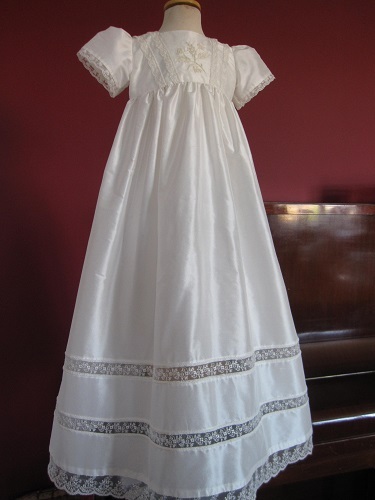 The Matilda Baptism Gown has been created by leading designer Linda Patrick of Little Doves. It encorporates all the beauty of the Edwardian period with exquisite embroidery. 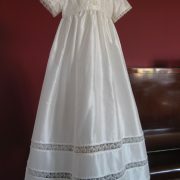 It has been created from the finest Silk Dupion with additional Nottinghamshire lace. 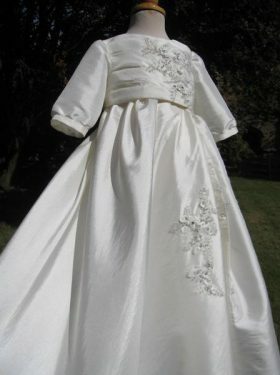 The Matilda gown has a lovely flow to the shorter style skirt. 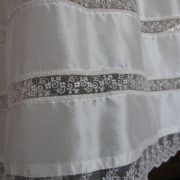 Plain in style until the hemline where you can see rows of insert lace have been delicately added. 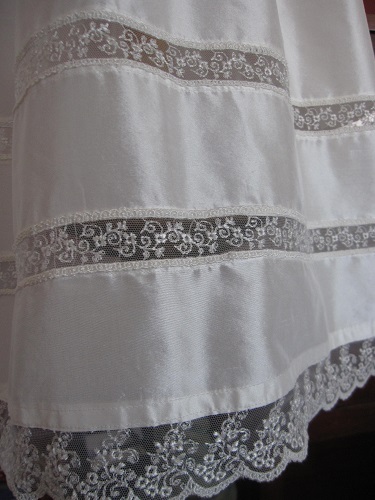 A pretty lace edging finishes the skirt to perfection. 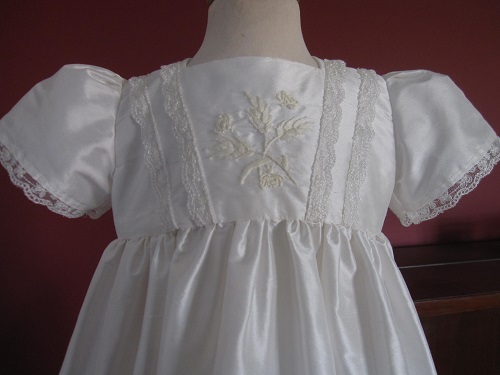 The bodice is embroidered with pretty flowers, from a pattern taken from the early 1930's. 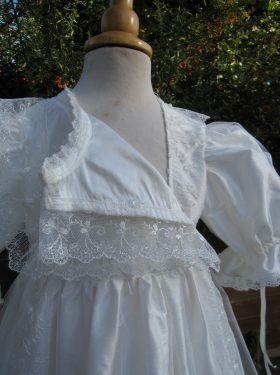 Lace trim is added for more interest. Short sleeves trimmed with lace finish the look. 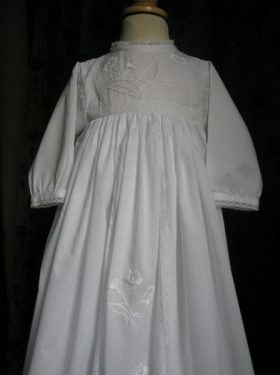 This Christening Gown is sure to become an heirloom to treasure for years to come. The Matilda Gown is available in white or ivory silk. 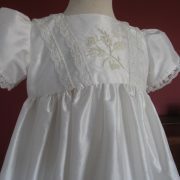 A variety of embroidery stitches and designs are available. 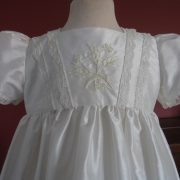 Or, maybe you have your own design you wish to be embroidered onto the gown? Please contact us to discuss your choice of embroidery. Bonnets, bibs and booties are also available for purchase. Please take a look at our accessories pages for more details.